It’s time to get excited, Twi-hards! Work on Breaking Dawn has finally begun in earnest, and leading couple Robert Pattinson and Kristen Stewart were spotted out and about in Brazil over the weekend, filming a steamy smooch for the flick. 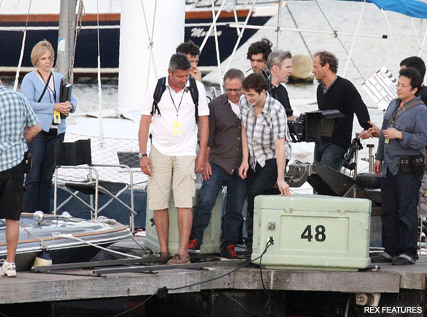 SEE ALL THE BREAKING DAWN ON SET PICS HERE! The pair were in Brazilian city Rio de Janeiro to film the hotly anticipated scenes, when Bella and Edward set off on honeymoon and take a boat over to the remote Esme Island. First up were the speedboat scenes, which Rob and Kristen were spotted shooting, surrounded by lights, in a stationary boat alongside a dock. A pair of stunt doubles soon stepped in for some of the at sea action scenes, before the cast and crew moved on to the next shot. Dressed in an elegant cream dress and black heels for the scenes, Kristen held tightly to Rob’s hand as they walked through the streets during nightfall, surrounded by extras. The loved-up couple laugh and joke, and its hard to tell if the cameras were rolling when they stopped in the square for a quick smooch. Earlier in the day, an uncharacteristically smiley Rob and Kristen were spotted soaking up the sun on their swanky hotel balcony, waving at fans down below, laughing and dancing around.